We can work with just about any kind of rider! Sessions are weekly, for either an hour or a half hour. Riders will learn to groom, saddle and ride to their ability. Our sessions are focused on physical and emotional development as well as riding skills. Riders will perform activities during the session to utilize various muscle groups, stimulate learning, learn to ride and have FUN! Safety is our number one priority, and our instructors are certified by the Professional Association of Therapeutic Horsemanship (PATH). We provide helmets or adaptive equipment. When and how much are sessions? THH also offers an automatic billing plan which charges your credit card a flat monthly rate. The rate for a weekly half hour lesson is $125 and a weekly one hour lesson is $175. This plan offers limited opportunity for make ups if lessons are missed, however, so be sure to read the policy. Please contact Dana to register for this program. What can the rider expect? The rider must wear long pants, usually jeans, and covered shoes. Boots are best, but athletic shoes are acceptable. The rider must be quiet and calm around the horses and treat them with respect. The rider should wear sunscreen and have a cold drink for after the session. THH is a Premier Accredited Center, certified by the Professional Association for Therapeutic Horsemanship (PATH Intl.). For more information about PATH Intl., please go to their website, www.pathintl.org. We learned many years ago that kids are not the only ones who can benefit from Therapeutic Riding. Many adults also have a deep love of horses, and a need for a fun, safe outdoor activity that also develops confidence and physical ability. We happily offer lessons to Moms, Dads and any other grown up who wants to participate. Costs for grown up lessons are the same as any of our regular riding sessions. What is a Typical Riding Session Like? Riders will usually begin by grooming and saddling their horses with instruction or assistance as they are able. Riders will then proceed to the arena and mount. They are instructed on how to ride their horse safely and under the supervision of an instructor. Usually in a half hour lesson there is about 20 minutes of ride time and about 40 – 45 minutes in a hour lesson. Riders are taught riding skills depending on their ability. Our primary goal is a safe and happy riding lesson. What Type of Riding Do We Teach? 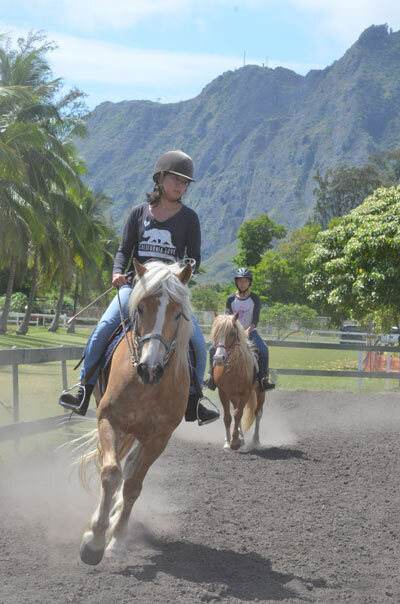 THH teaches basic riding skills using a variety of horses and equipment. Our instructors come from varying backgrounds, and each has a lot to offer our riders. We have both English and western saddles, but teach basic English seat and rein. Some riders have become advanced enough to help school our horses or become instructors. When riders become too advanced for our program, we will refer them to a competition barn with great pride! Riders need not have a diagnosis in order to ride in our program. Therapeutic Riding can benefit just about anybody! We strive to provide services to as wide a range of clients as possible, however there are certain individuals for whom therapeutic riding may not be an appropriate activity. Please see the rider signup package below for a list of medical conditions for which a physician's consent is required prior to providing services. Contact Dana with any questions regarding suitability. This set of forms contains all the information that THH needs in order to provide services to our clients. All applicable forms must be completed prior to the first lesson. This set of Policies for THH for participants, volunteers, the facility and our Equine.